Textures are the "in" thing even in a world that looks so much at the new flat design concept, and the reason is not difficult to understand. The right texture can add interest, and make your slide content look crafted. To understand this better, look at Figure 1, below. The textures used for slide backgrounds on the left have either too much detail or possess very dark and saturated values color-wise. The textured backgrounds on the right side are just right in comparison, they are simple, uncomplicated, and do not distract from the rest of your slide content. If you cannot find the perfect texture, it's best to leave your slide background unaltered. Are Textures and Pictures the Same? Texture and picture fills for slide backgrounds have so much in common. Yes, the same picture can be used for both a texture or a picture fill, but the results will differ. The main difference is that while a picture background results in your slide using a single picture as a backdrop, using a texture background can result in the same picture being tiled across the slide background, imagine a wallpaper on your room's wall with repeating motifs. Also some pictures lend themselves better to being used as textures, especially if they are seamless. 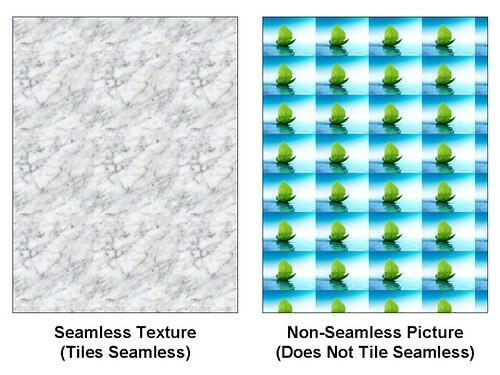 Look at Figure 2 below, note that while both samples show texture fills tiled up, the sample on the left uses a seamless texture that tricks the human eye into seeing a single expanse. The texture on the right however does not tile up well and you can see seams every time the picture tiles up. i. File: Click this button to open the Insert Picture dialog box, as shown in Figure 5. In this dialog box, navigate to the folder where the texture to be used as slide fill is located, select it, and click the Insert button (highlighted in red within Figure 5). iii. Online: This bring up the Insert Pictures dialog box, as shown in Figure 6. Within this dialog box you'll find the online picture service providers listed, such as Bing Image Search, Facebook, Flickr, and from your OneDrive account. Other than these three services you can add pictures from your Facebook and Flickr accounts, but only after you connect to these accounts from within PowerPoint. Learn more in our Insert Online Pictures in PowerPoint 2013 tutorial. Click the down-arrow located in this area to bring up the Texture drop-down gallery, as shown in Figure 7. Choose from any of these readymade textures available within PowerPoint to change the slide background of your slide. Note that all the textures you see in this gallery are seamless, this means that they tile up on your slide background repeatedly without exposing any seams to form a continuous pattern. These options show up in the Format Background pane only when the Tile Picture as Texture check-box is selected. These options are explained in the Tiling Options tutorial, do note though that the linked tutorial relates to shape fills but those options work in the same way for slide background fills. i. Click the Apply to All button to fill all slides in the presentation with the selected texture. In Figure 8 you can see the slide background of the entire presentation filled with a texture.